Thursday May 27th 1909 Charlie did not work today but Mr Vaughn was here and they are at work on the outside of the new part. I did the regular work and was putting things away for them to begin on the tearing down inside tomorrow. I work all the time, Niv Lideley was out to see about plumbing. I will not have it done Friday May 28th 1909 Will did a big churning for me before he went to his own work I put in some time cleaning of the plaster after Ed took out the dining room window to place in the earth and of stairway in the afternoon he took out the end of the dining room. Charlie worked again today. The man finished the tin roof and Charlie did some painting for Will. A nice day. Saturday May 29th 1909 This was a hard day. The men tore out the partition between the two front rooms and Charlie put in another window in the north end of the sitting room. The dirt from the plaster was over every thing. I worked till dark trying to clean up some. Will to town in afternoon. Mr Hoffman cleaned the hen house for me. [Rose?] [Whetilan?] 26 years old today. 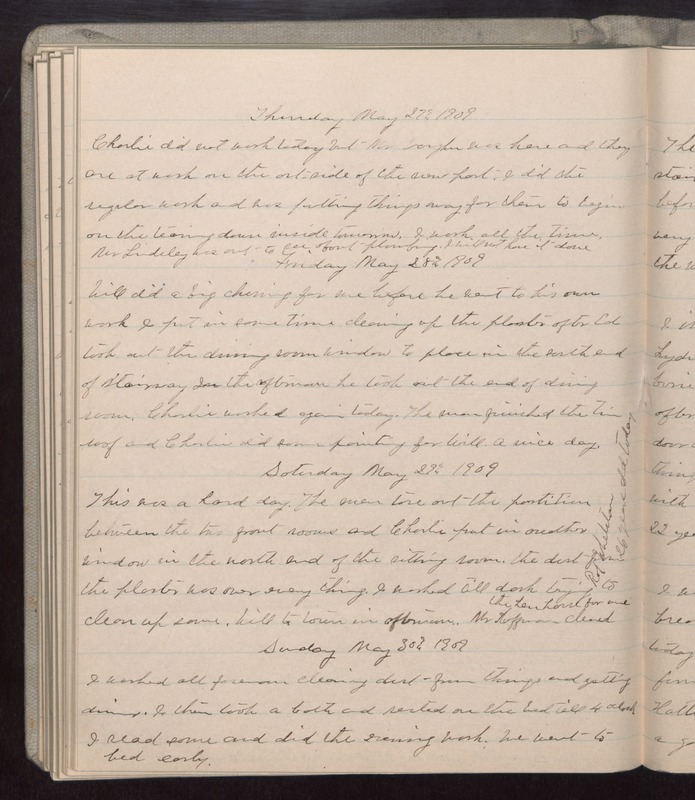 Sunday May 30th 1909 I worked all forenoon cleaning dirt from things and getting dinner. I then took a bath and rested on the bed till 4 oclock. I read some and did the [renning?] work. We went to bed early.